The other night, I drifted off to sleep thinking about an amazingly sweet exchange between my husband and teenage son that I had overheard just moments before, without them even knowing. I had gone to bed a little while before they had, and as I laid there in quiet prayer with my Creator, reminiscing with Him about my day and expressing gratitude for the multitude of tiny little gifts that I had found in it, I heard my precious boys pass each other in the hallway and give one another a particularly touching, warm and genuinely loving “good night, I love you, and sleep well”. I cannot describe how full and tender that made my heart, and it became yet one more thing to immediately add to my mental gratitude list for that day. We’re the type of family that makes it a point to offer one another loving phrases—warm “hellos” and “goodbyes”—as a normal part of our daily exchange. For us, that type of connection is something that we feel always needs to be consciously kept vibrant and strong; otherwise, it can easily fade. It can be way too easy to become complacent and to start to take one another’s very presence for granted. And so while my husband’s and son’s simple yet genuinely caring exchange was no surprise to me at all, I felt like I was meant to hear it in an especially “special” way, and to be affected by it and inspired and moved in the way that I was. See, as I get older, it’s the simple little flavors that land on my palette for me to taste that make my heart swell with love, hope and gratitude. It’s these brief-but-heartfelt moments, like beautiful and shiny red rubies, that make an impact on me and give me the optimism that goodness and love can move mountains, and that it is the stuff that we survive on. Any day can be dotted with little jewels of genuine kindness and care, whether they exist in our own households, or with acquaintances or even with strangers; they become like the twinkling stars in our night sky that offer up some beauty and awe, and fill us with hope. They’re the sprinkle of sugar on top. Finding those glistening and colorful jewels, like the glossy and juicy-red cranberries bursting in a sweet and tangy sauce, helps to feed that desire within us to live in a more connected way. They add a gorgeous yet simple shimmer to our existence, and fill our beings with all the good stuff that we need to survive, and that we never get tired of. Who’d have thought that a simple but genuinely sweet and loving “good night” could inspire so much? I’ll just say that I’m sure glad it did. -Place your glasses in front of you, and to the bottom of each glass, add about 3 tablespoons of the Graham Sprinkle; press down on it gently with a spoon to even/flatten it a bit. -Next, pipe in about 3 tablespoons worth of the “Cheesecake” filling. 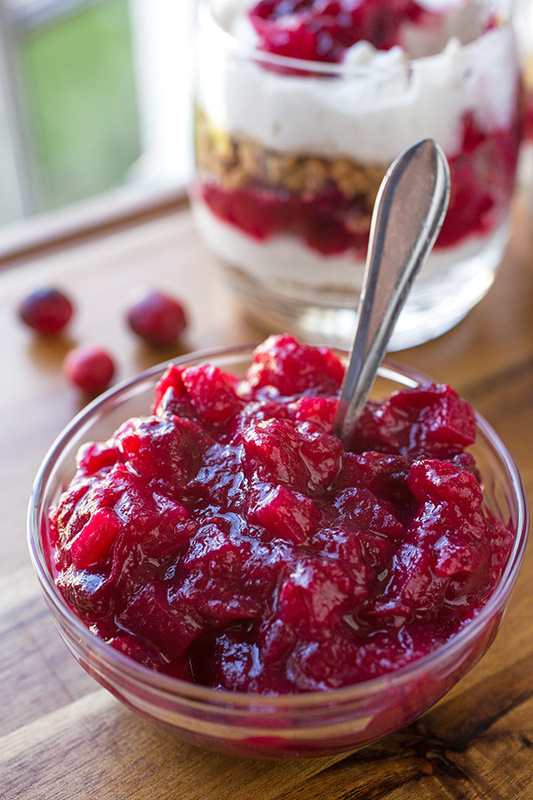 -Then, spoon over that about 3 generous tablespoons of the Cranberry Chutney. 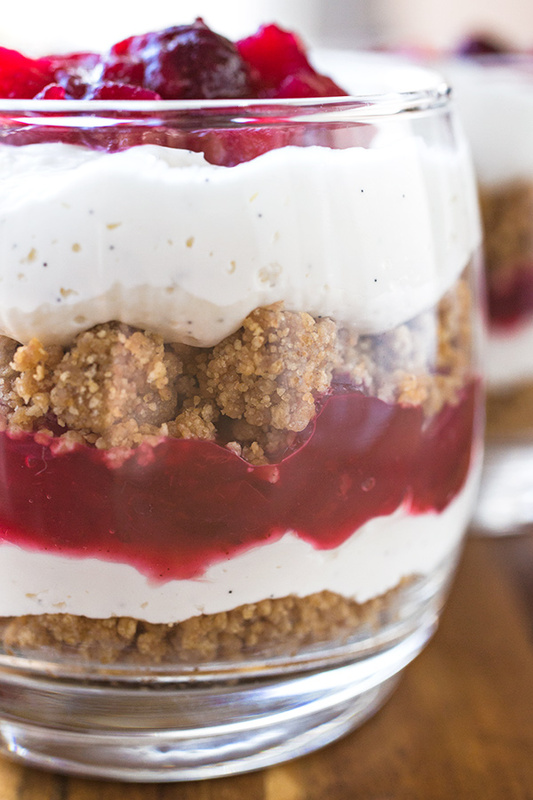 -Repeat the layering once more with the Graham Sprinkle, and then the “Cheesecake” filling. 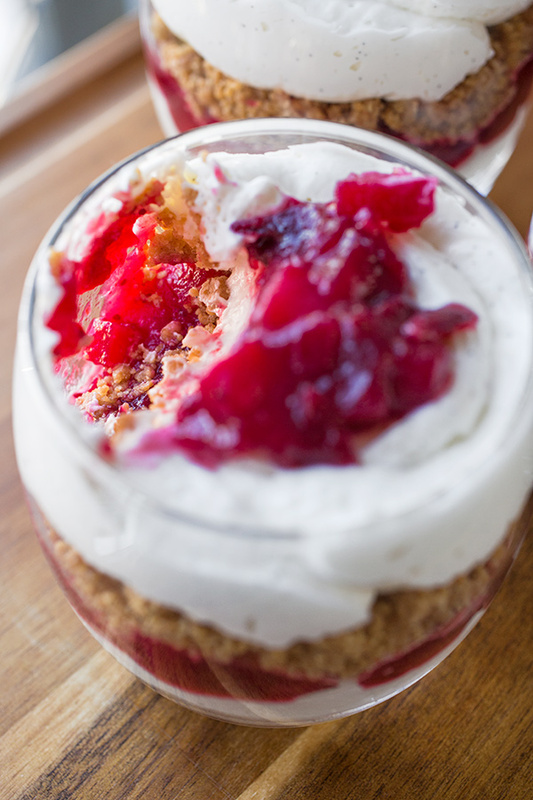 -Finish with a heaping spoonful of the Cranberry Chutney in the center. 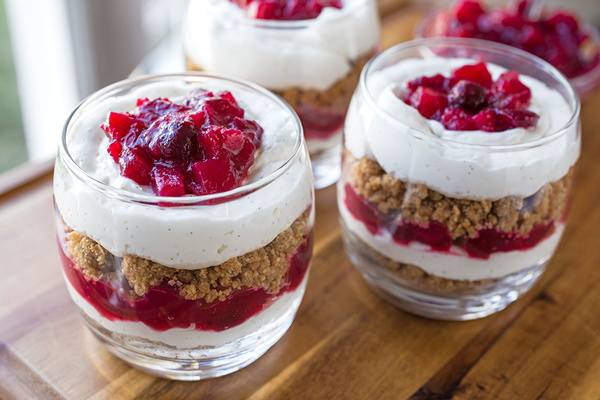 -Chill the parfaits for at least 2 hours, or even overnight. 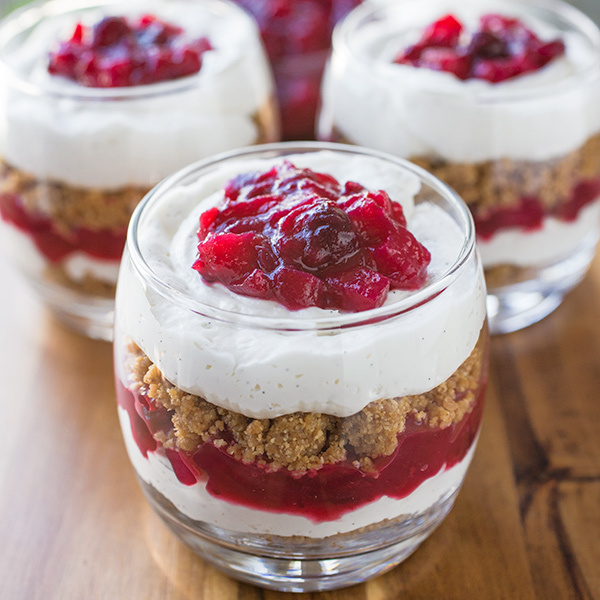 -Add the finely processed graham crackers into a medium-size bowl; add the remainder of the ingredients, and using your fingers, work the mixture together until moist and slightly crumbly, and well combined. -Keep covered, or place into ziplock bag, and keep in fridge until ready to use. 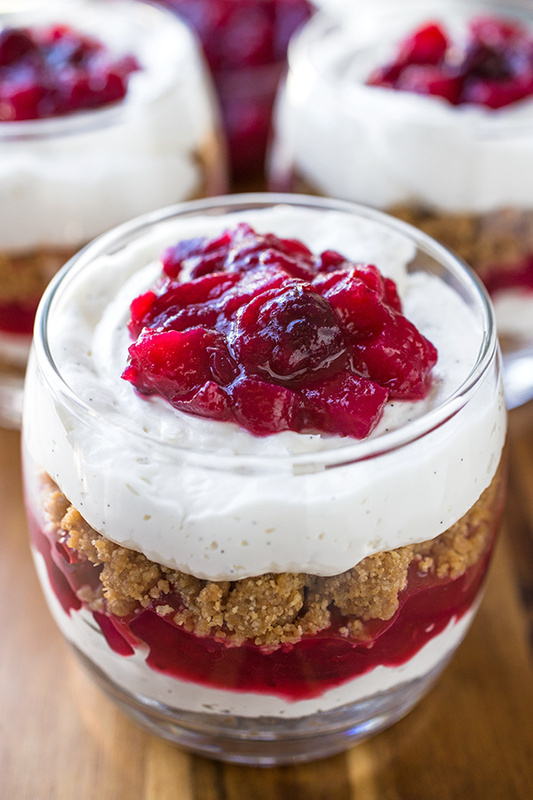 -Add the softened cream cheese and the sour cream to a medium-size bowl, and using a spatula, work the cream cheese and sour cream until smooth and slightly creamy. -Next, add in the vanilla bean paste and ¼ cup plus 2 tablespoons of the sugar, and using an electric hand mixer, mix the ingredients until smooth and creamy; set aside for a moment. -Add all of the ingredients up to and including the granulated sugar to a medium-size pot, and stir to combine. -Turn the heat on medium-high to high, and bring the mixture to a rapid simmer; cook for 5-7 minutes, stirring every now and again to move the cranberries around, until the cranberries begin to pop and split. -Pour the chutney into a clean bowl, and stir in the pumpkin pie spice; allow to cool completely. -Store any unused portion in a covered container in the fridge for up to a week or two. What a lovely dessert! Will have to try this after the Thanksgiving pies are consumed- 🙂 So glad you heard the good nights between your son and husband- I am fortunate that our kids and my husband are the same as yours… even though you know the love is there, it is wonderful to hear it, too! Wishing you and yours a happy, warm, and comforting Thanksgiving holiday!! You are definitely someone I am thankful for- cheers! I just wanted to say thank you for this recipe! I have used it a few times over the last year. I am making it again today. It’s by far the best cheesecake recipe I have ever used. 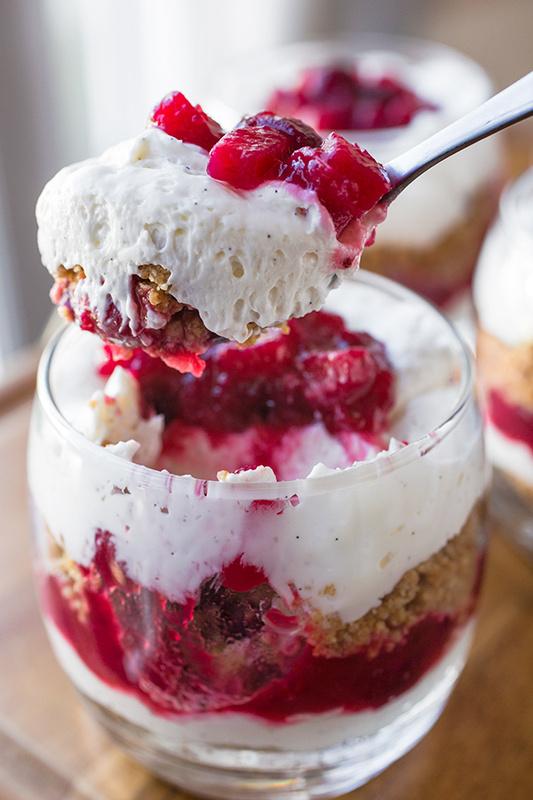 I dream of these cheesecake parfaits all the time!